Geoffrey Moore's now-classic Crossing the Chasm became a must-read book by presenting an innovative framework to address the make-or-break obstacle facing all high-tech companies: how to gain market share from early adopters and from mainstream consumers. 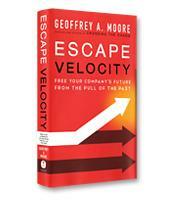 Now, Moore's Escape Velocity offers a pragmatic plan to engage the most critical challenge that established enterprises face in the twenty-first-century economy: how to move beyond past success and drive next-generation growth from new lines of business. How to use organic innovation as a complement to M&A to systematically migrate an enterprise's portfolio out of lower-growth and into higher-growth categories. How to leverage asymmetrical resource allocation to create a powerful and sustainable foundation for a long-term competitive advantage. How to leverage target-market initiatives as accelerants to growth. How to manage your innovation resources to create maximal returns. How to fundamentally change the execution cadence of an organization, creating an irreversible tipping point along the way.